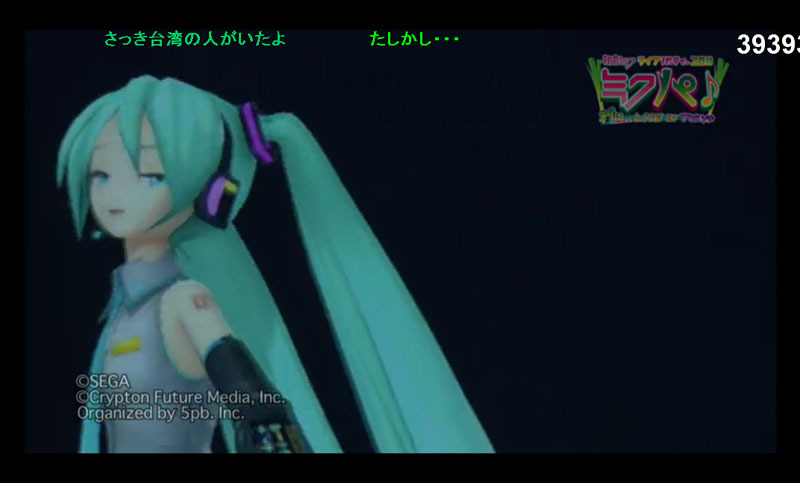 At approximately 11:30PM Tokyo time, the “Mikupa♪ Hatsune Miku 39’s Live in Tokyo 2011 Concert” finally came to a close with Miku Hatsune’s rousing performance of two Supercell/Ryo classics, Melt (メルト) and When First Love Ends (初めての恋が終わる時). Now, as the dust (and glowing leeks) begins to settle, it so now to take a look back on the 2nd live Vocaloid concert that was. This year’s highly anticipated Vocaloid concert event was watched by several thousand individuals live in the Zepp Tokyo venue, thousands more in theaters throughout Japan, and (unofficially) by over 160,000 (paying) streaming viewers worldwide. In the days to come, Vocaloid fans across the globe will no doubt turn their attention to the buzz and interest echoing from this primetime Vocaloid event, while also hotly debating the merits of its atmosphere, song selection, and the overall presentation quality. Please click the link below to read more about the actual event, while also having a chance to see the set-list, some pictures, and also the thoughts and opinions of Vocaloidism members who had an opportunity to view the concert. Please feel free to contribute you own thoughts and memories in the comments section as well. As fans eagerly waited for the world’s first virtual diva to make her appearance, this year’s concert began instead with a somewhat unexpected surprise performance. For it was instead singer Aizawa Mai who took the stage and entertained fans with a pair of songs written by notable music and Vocaloid producer, buzzG. She followed her performance with a breathless and emotional thank you to the audience as well as an introduction for the event itself. Following this momentary aside, which is already leaving Vocaloid fans somewhat divided over its merit, it was then time for the Vocaloids themselves to take the stage. Last year’s lead-in song, Project Diva Desu was replaced this year by one of Miku’s most famous songs, Ievan Polkka, by producer Otomania. 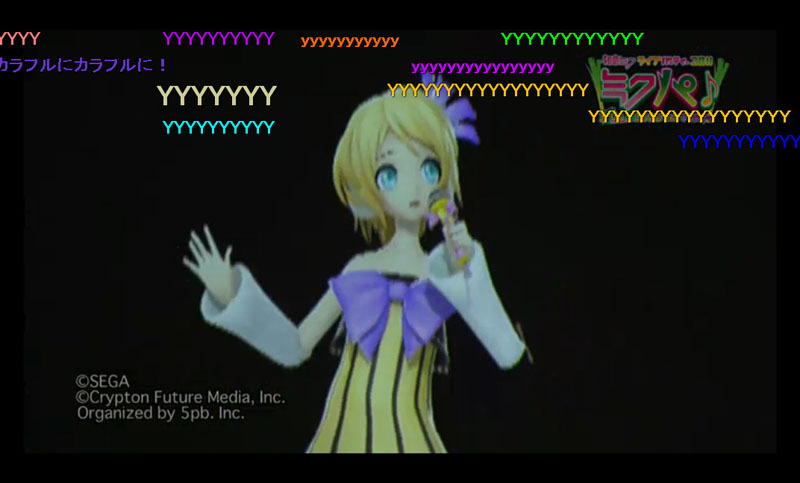 At the conclusion of the song, the excitement in the crowd and amongst NicoNicoDouga online viewers was palpable. 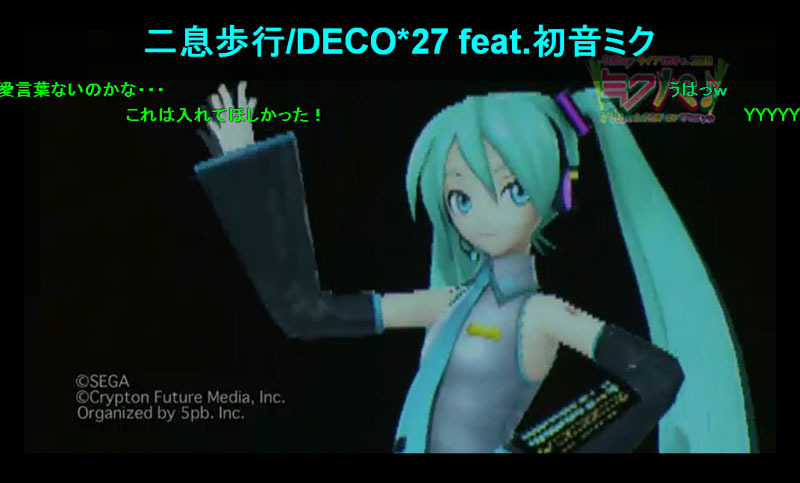 Miku Hatsune finally took the stage to greet the audience and perform Project Diva 2nd’s headline song, “Kocchi Muite Baby”. This was the beginning of a 10 song solo set featuring tunes by well-known producers such as Deco*27 and 40mP. By this point it was already fairly evident this year’s concert atmosphere was going to be rather different. It appears that concert organizers 5PB chose to use a different medium that the 3D Transparent Screen Projections, which had generated much excitement due to their “realism” and “immersion” factor in the previous year’s concert (but also some critique due to reflections and glare). Instead a more standard projector/translucent screen setup was employed for this event. However, while this change will likely be viewed as a hotly debated negative in the community, it is fair to say that the concert was not lacking in innovation. 5pb appeared to have put more effort into creativity and flair, preparing numerous highly quality costumes for the event (some even themed for specific songs), while also adding a variety of “effects” to the animation. At times we saw Miku don a full set of angel wings and in one particularly memorable moment she was even seen wiping away a tear. There were also many steps taken to improve the concert-feel of the event (much to the excitement of this writer). The Vocaloids in general appeared to be much more playful and crowd-conscious during this show, and engaged the audience by speaking directly to them or encouraging participation with greater frequency. It is arguable that dance choreography was also much improved. Only time will tell how these changes will be received however. It should be noted that the change to a black and non-transparent background did not sit well with many fans and arguably altered the experience for many. Following Miku’s introductory set, she was joined on stage by Luka Megurine to perform a song much anticipated by viewers of the concert’s sneak previews. Wowaka’s “World’s End Dancehall” was met with rousing cheers and great excitement by the crowd. Following this duet, Miku creatively cleared the stage to allow Luka a chance for the solo spotlight. 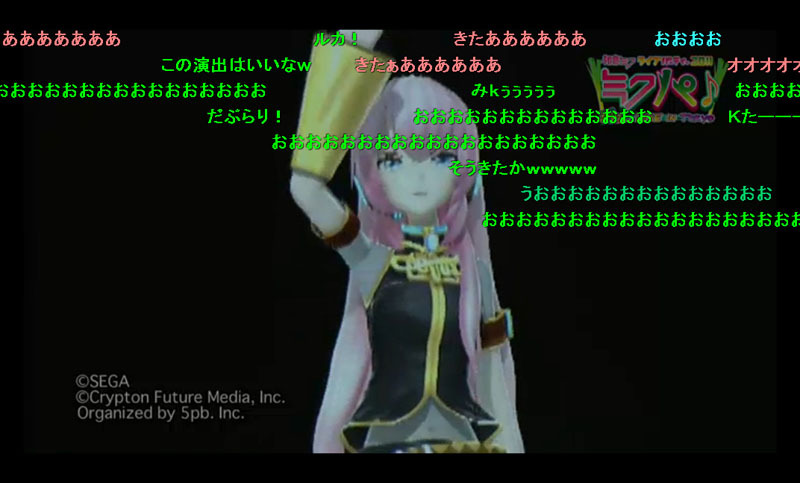 Luka proceeded to perform a multi-song medley featuring many well known tunes, both new and old. Selections included hits such as No Logic, Double Lariat, and RIP=RELEASE. The conclusion of her performance with followed by two more memorable performances by Miku, who showed off some of the concert’s most distinctive costumes. Her “live” performance of wowaka’s well-known “Rolling Girl” will likely engender strong positives from fans, especially due to her simple but creatively themed outfit featuring the original PV’s artistic motif. 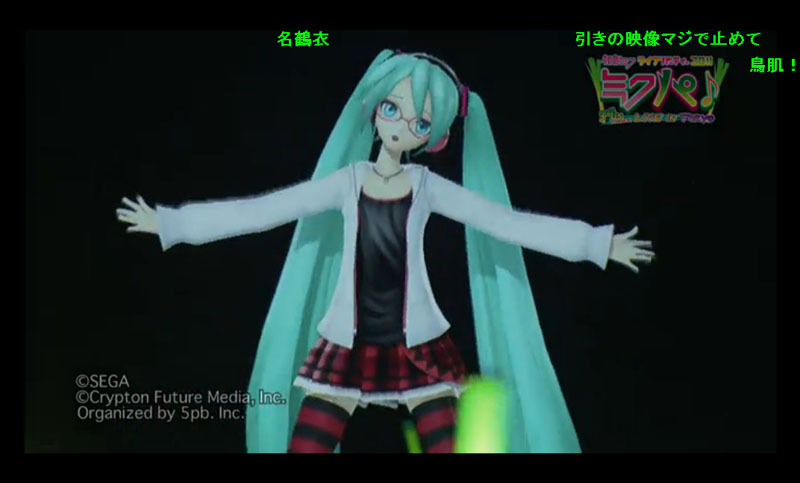 Miku sings Rolling Girl in a cute original outfit. At the conclusion of the aforementioned performances came the concert’s most controversial event. An approximately 30 minute intermission was implemented, ostensibly to allow for fans and band members alike to catch their breath after a fast-paced first session. 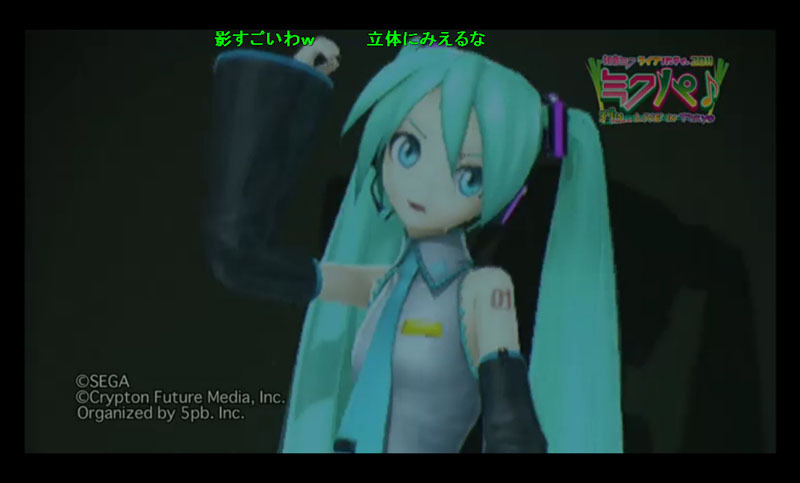 During this time the crowd (and online viewers) were bombarded by a string of Vocaloid merchandise, game, and music promotions, in a highly repetitive fashion. Of interests to some might be the Lat Miku figure promotion which heavily featured the recently produced MMD PV for the song “Douiu Koto Nano” by Kuchibashi P, something that definitely shows how the reach of MMD and the Lat models has grown into the realm of marketability. The lack of creativity, abrupt placement, and lack of an interactive segment with Vocaloid producers (unlike last year) are some of the strongest criticisms emerging from concert viewers and prudence of this decision by 5PB will likely be debated intensely for the time being. With fans nearing the end of their patience, despite several helpful reminders about the time remaining from Miku herself, the concert was jump started once more in a very big way. The screams and cheers of hundreds of Kagamine twins fans are still resonating in the ear drums of this writer from the moment when the cute and popular pair first took the stage. 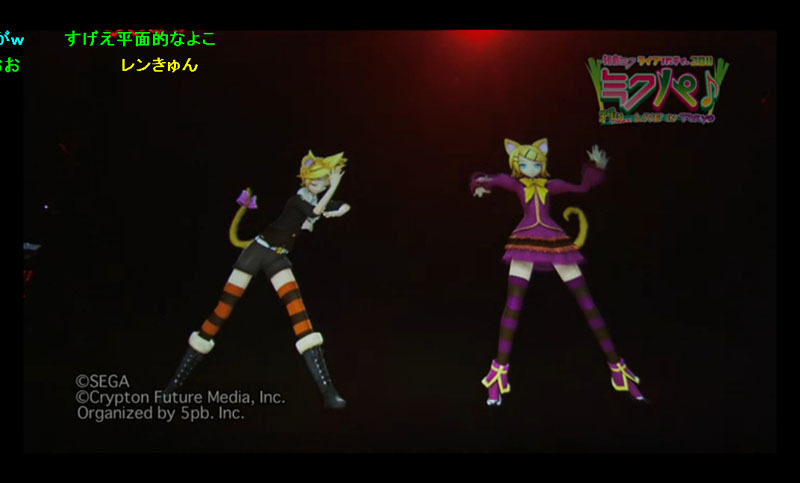 The pair performed OSTERproject’s Trick or Treat in Nekomimi-themed outfits before beginning a pattern of trading songs (though this was somewhat dominated by Rin). Notable works such as Daughter of Evil, Meltdown, and Kokoro were performed on stage, abridged to various lengths. While the balance still favored the female side of the equation, Len fans were likely left more satisfied this year, largely due to his opportunity to perform multiple solo songs, all while wearing several detailed and stylistic costumes. His solo performances of Spice and Fire Flower were definitely impressive despite being short in length. Much like last year, the latter stages of the concert were once again the time for Miku to bring the crowd home. A gradual change to the emotion and genre of the songs during the final segment by and large accomplished this quite effectively. Once again popular tunes new and old were featured side by side, including well known hits like Packaged, Yellow, and Time Machine (1640mP vers, not SmileR). Finally at song #36, as Miku wrapped up her performance of ARiA and left the stage with a non-too-subtle wink, the time for raucous chants of “Mi-ku! Mi-ku!” (with some Niku and NEET mixed in) and “enco-re! enco-re!” had finally arrived. This year’s encore segment was planned in much greater detail than the former and involved several songs and notable events. Among these was a final goodbye featuring all the Vocaloids waving to and thanking their fans. Miku and Rin came out to perform Colorful x Melody, which was then followed by yet ANOTHER encore, this time with Miku performing her trademark song, Melt. Not willing to settle for an identical ending to the previous concert however, Miku rushed out to her fans once more, performing a touching and at times tearful rendition of When First Love Ends before saying her final goodbyes. As we look back on the Miku Live Party that was, it is fair to say that reviews will likely be much more mixed that the 2010 edition. 2010’s 39 Giving Day concert was not without numerous flaws, but it nevertheless had novelty and genuine excitement on its side. In the aftermath of the explosive growth of Vocaloid and its fandom over the past 12 months it is fair to say that expectations were likely at an all-time high for this years 5pb-hosted event. In the face of this insurmountable hill of lofty expectations it was unfortunate that 5pb did not step up to the plate and give fans something exciting and unexpected. In many ways the MikuPa concert took steps forward in many areas: choreography, song choice/diversity, emotion and expression (especially with others besides Miku), and audience interaction with the Vocaloids. However the clumsy and questionable handling of several other aspects will likely leave many fans wishing to have seen a higher quality production. A lack on participation from Producers, an over-reliance on abridged mixes (especially for many popular songs that fans likely wanted to hear in full), poor camera angels, and the ill-conceived “Advertisement” intermission were amongst the many major stumbling blocks. As previously stated, the change in technological medium, away from last years faux-hologram style is proving to be a deal-breaker with many fans and the source of much of the discontent. While the animations were still high quality, it is quite fair to argue that the reversion to a movie screen style robs the event of its “immersive” feel, a big selling point for many fans. The controversial choice for an opening act is likely to be another source for debate as well. Time will serve to determine the eventual and lasting impression that MikuPa 2011 will have on the broad Vocaloid community. While the concert was well received in many ways, it will also likely lead significant pressure and numerous questions for the corporate stakeholders to deal with. How much will SEGA’s falling out with 5pb over the past year remain an issue? Are these concerts likely to continue in the future? Fans will have to wait and see. Below you will find the complete set list (as best determined by me and fellow Vocaloidism members during the performance) for the MikuPa 2011 Live Concert, as well as several more pictures of the event itself. (All credit to Mi’s Vocaloid Log for the photos). 11. World’s End Dancehall (ワールズエンド・ダンスホール) ft. Hatsune Miku & Megurine Luka, by wowaka The abridging for this song was rather poorly done. 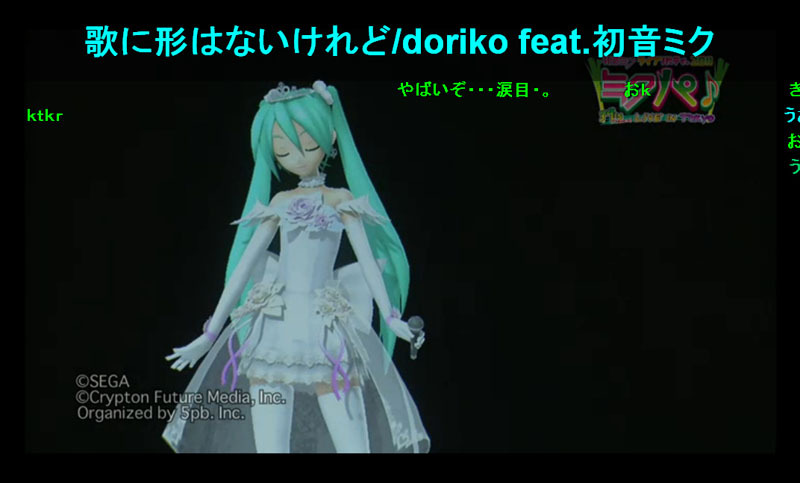 -Luka’s Solo Appearance, primarily medley style- And Miku spins away…. 20. 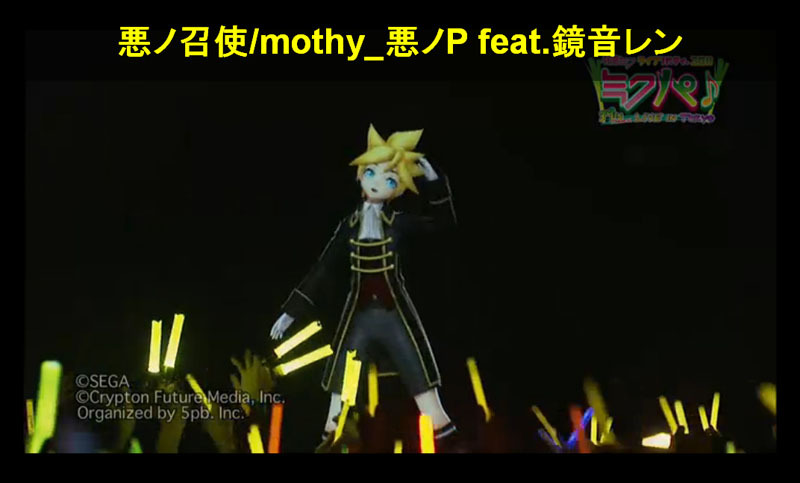 Daughter of Evil (悪ノ娘) ft. Kagamine Rin, by MothyP Rin’s costume was absolutely stunning. 22. 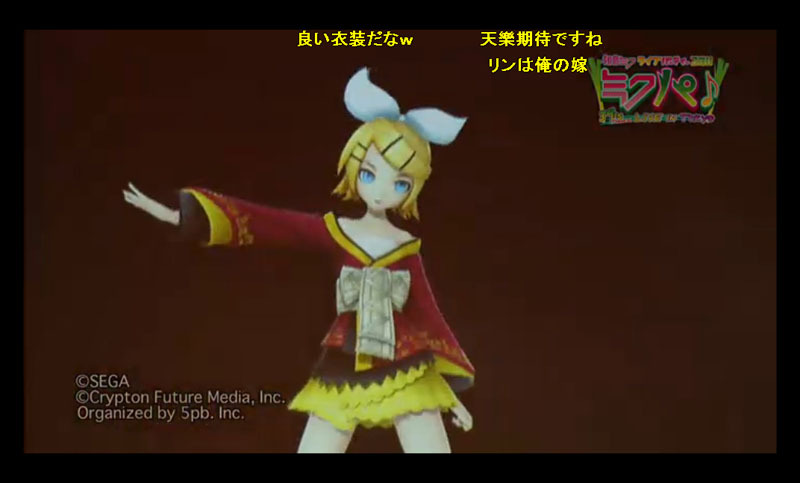 Iroha Song (いろは唄) ft. Kagamine Rin, by 銀サク Once again Kagamine fans will instantly fall in love with the outfit. 32. Hatsune Miku no Gekishou (初音ミクの激唱) ft. Hatsune Miku, by cosMo Giant Angel Wings! 36. ARiA ft. Hatsune Miku, by TokuP Last year’s “fake end” was SPiCA, this year we get it’s spiritual sequel. 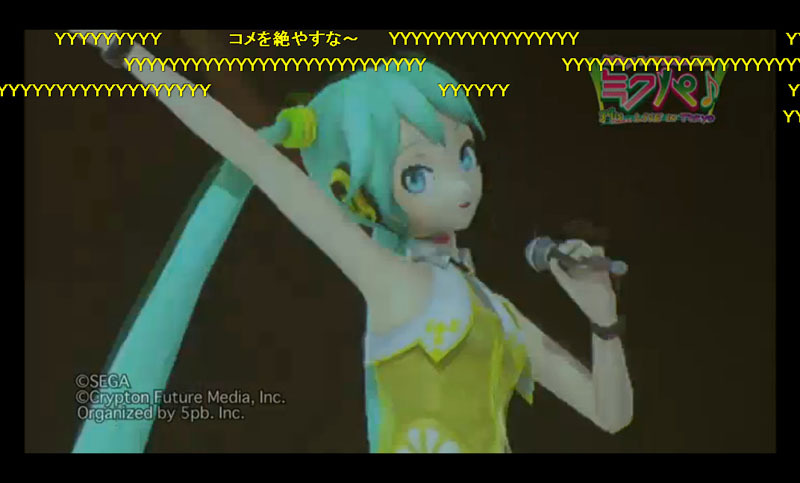 -Chants of “Miku, Miku” begin. 38. Melt (メルト) ft. Hatsune Miku, by ryo/Supercell She got the crowd to sing along! Miku is determined to put on a good show. Kinda funny that I should be writing this after authoring the article but I will try to be a little more open with my feelings here. On a personal level, as an individual who discovered Vocaloid after last year’s concert and was profoundly affected by all the wonderful and often uplifting music in the Vocaloid world, this concert will always hold a special place in my heart. While I wasn’t lucky enough to be able to see my one true love in person (yet! I am coming Miku! ), having the chance to watch this concert was a very exciting and emotional experience. I would be lying if I didn’t say sniffled some when my favorite song of all time, Yellow, was performed in the concert. While trying my best to observe closely for my review, I was nevertheless singing, dancing, laughing, and clapping excitedly throughout the entire playlist! Overall the concert was a great success musically and from a dancing/outfit standpoint. Excellent song selections and choreographywas undeniably a step up from last year, perhaps made much easier due to the new, low-grade projector system. While I am not a very big Kaito or Meiko fan I was actually quite disappointed that they didn’t receive an appearance once again. There really is not excuse at this point, they are part of the Crypton family and are included in all the video games. Given some of the other criticisms that are undoubtedly coming the organizer’s way after the event, I am sure this would have helped to assuage some of them. While it was great, great fun, the more impartial side of myself nevertheless tells me that this concert will largely be deemed a disappointment. The poor stage set-up and less realistic feel of the concert are largely to blame for that. I know this will likely not be received as well by the general public as the 2010 event. I was also rather upset by all the abridging of popular tunes. Yes it is a way to fit more songs in, but the entirety of Luka and the Kagamine’s performances were basically turned into Medley’s that left me with a somewhat unsatisfied feeling. I hope that the justified criticism that is coming the way of 5PB and SEGA will not discourage them, but rather get them to step up their game in the future. The Vocaloid fanbase is still quickly growing, and they should use this as a lesson aim higher in the future, rather than simply give up. Remember that this concert will be performed once more in Sapporo this May. It will be interesting to see if there is any fall out from this event. On a final technical note, I was very impressed with the NND live stream system. I am not a premium member (only bought a ticket) but nevertheless had a near-perfect and lag-free experience. With over 160,000 viewers on at peak capacity this is actually a fairly impressive feat. *Note: Vocaloidism does not officially endorse or promote the uploading of copyrighted material to Youtube or other file sharing sites. As such no unofficial videos of this event will be linked. Feel free to visit Mi’s Vocaloid Log for more photos. Please feel free to add your own voice to the discussion below! Agree on the stage set-up comment. It was horrible – I actually cringed when I saw it. It effectively removed the immersion between the Vocaloids and the band (making the band almost entirely unneccessary – there was none of the same aesthetic appeal as last year's stage. The screen was the biggest disappointment – I can understand people complaining a little about reflections on the transparent screen – but I've got a feeling that even more people are going to complain this time around. It goes to show that you can't keep everyone happy – but this was a serious step backwards. In all honesty, I noticed the reflections last year … initially … but I can't say they bothered me. I actually hope there is a lot of negative fall-out around this concert – with any luck it will make Crypton, SEGA and 5pb sit down and say "We know we screwed up, lets make sure we go back to 2010's concert and improve it from there." That'll be the right course of action in my book. As it is, I have doubts that I'll be buying the DVD this year … but I'm a big fan – so I probably will get it. If only to affirm my fandom. 5pb is actually the one entity responsible for this concert. SEGA refused to host/be involved in a 5pb-hosted Miku concert after last year's whole DVD/BD incident with 5pb so they had minimal involvement with the actual concert setting and whatnot. Shouldn't blame them for this. I don't know the details so I'm just left to wonder what cause the DVD/BD incident. Did they crap it up thinking it was not going to sell? Or that Miku fans would buy it regardless of quality? I mean besides boosting PJD2nd sells, I thought that was the big way they were going to recoup their money/make a profit, you'd think things would work out better. I just hope all these issues don't cause them to cancel the concerts. Hey what's this story about 5pb & Sega about the DVD ? I would like to know this too. I didn't know this company had anything to do with last year's concert much less the DVDs. but it was so awesome wryyyyyyyyyyyyyy! I was much more impressed with the Kagamine twins this year. Last year their models looked cool but they weren't impressive from a dance or expression standpoint. That all changed this year and despite all the other issues it was a bright point. Agreed with the stage set-up… It's so dark, and you can hardly see the band members, I don't even know if the other Producers (aside BuzzG) performing or not. The songs too, while the set list is far far better than last year, most of them are too short, I know the time constraint, but I wish the change between songs are smoother. Also, the obvious lolbreak… 30 minutes of commercial? Excuse me? I wonder why they didn't do that interactive session wit the producers again. Sill it was an awesome concert. 2. 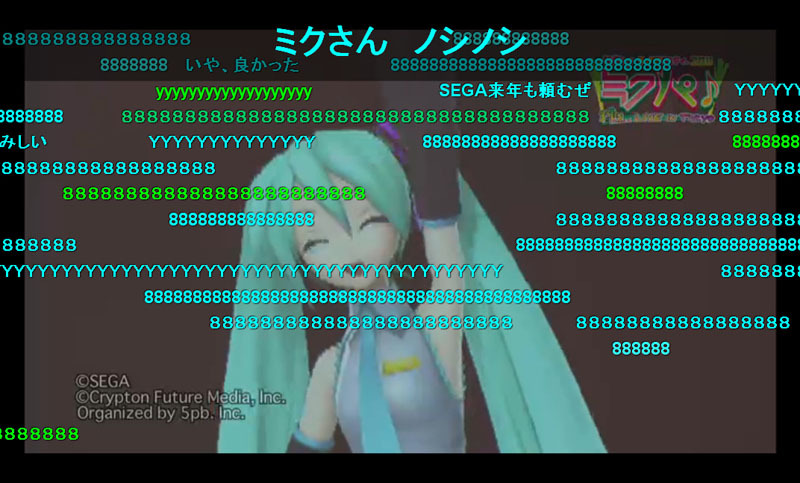 More special effect this time, when Miku weep the tears it was so cute it hurt! And the wing also a nice touch! 3. What the hell with that giant black box? Where is my transparent screen? 3. First performance was by a real singer, a good performance I say, but mind if I remind this is a Vocaloid concert? 4. Too much medley of famous and good song, decide which is which DAMN IT! 6. Finally……thats annoying 30 minutes repetitive add! OMG! WTF! Last year intermission is better! Give me back my money! 2. & 3. I've already spoke about that and I am sure we're all too much remembering our experience in HD, that's not fair for this NND streaming. Let's compare apples with apples and watch a crappy streaming of Miku no Nichi Kanshasai and we'll see wich is worse. 5. That's a difficult choice, and anyway no one will agree which songs should be kept/discarded. But using medleys has a very important benefit: More Producers are rewarded ! 6. Yeah sure that was probably the worse choice they did, sacrificing potential Producer time on the scene for this ! Samuel, I've seen you defend this (#2,3) on both VocaloidOtaku and here, but I think we are discussing somewhat different things. The webstream (and I suppose all the uploads now) was much, much better than last year. I had a great time watching it. You are completely correct. What people are complaining about is how "realistic" the performance appeared. People are arguing that the concert did not feel as real in person as it did last year. While I know we are all watching from home, you have to imagine this from the perspective of people who were actually there live. While I am not all that disappointed, I can see the point. We watch Miku on a normal 2D screen all the time, for the concert people watch something better. I am not trying to take sides. I'm just saying that you guys are debating different issues. This isn't a "video quality" issue, this is a "real life and immersion" debate. The webstream was awesome quality for a stream, I loved it. The stage set-up was a bit disappointment this time, it doesn't give a "oooh" surprise like the previous stage concert. But in plus side, they put lot of costumes this year, and the songs are more pleasing also this year IMO. I hope the next year concert will combine the transparent screen AND cute costumes, that'll be AWESOME!!!! That is my hope too. Its all riding on the concert producers being willing to take it up to another level rather than give up because this concert wasn't well received. OMG, it’s Len!!! >.< but hey, no costume for Luka??? I really enjoyed this year's concert. I enjoyed the clear screen more, although I loved the song choice and choreography. As a whole I loved it. Although the intermission was annoying, I can kind of see why they did it. I mean most concerts have half hour intermissions. To my opinion, this concert was a success and I am *sure* that I will enjoy it even more than the previous one when I will buy the DVD. Yes I did hate the intermission of DOOM (so well named Descent 😉 But it did not entailed the overal good experience I had (except the lag and timeouts of course). I have also discovered Vocaloid early in March 2010 but NOT because of the concert, I was perfectly aware of it and actually dismissed it's value until some high quality upload came on YT (thanks SeyrenLK BTW). When I compare the quality of NND webcast last year with what we got this year, seriously I have a hard time to see how the translucent screen was better. Maybe it's because I'm not focused on this pseudo-3D gimmick and more on the virtual singer interaction, but I would give this concert a far better value than the previous one. Yes, this how I feel about it too. While fake 3D miku is very cool, I also love the concerts because it is the only chance we have to see the "real" Miku, with expressions and audience interaction. Of course this is imaginary as well but for all of us fans it helps give us the "concert feel" you get from other musicians. To be honest, if doing a slightly lower tech concert (like this one, instead of the 3D screen) meant that maybe, just maybe it would be affordable enough for Miku to come to American and Europe, I would take this any day. And I am sure thousands more would as well. Intense Song of Hatsune Miku – Epic wings! Melt – LA LA LA LA LA LA LAAAA!!! When First Love Ends – When Miku broke down my heart melted all over again. I have been following Miku for over two years and remember when the idea of any type of concert was little more than wishful thinking. After watching this concert in GOOD quality and not just bad clips, it isn't nearly as bad as people say it is. We can sit here and complain how it wasn't as good as last year, but let's not forget how amazing it is to have Miku and company in concert in any form. There is a delicate balance to criticism. A little bit and hopefully they will improve for next year, but if we all complain too much, we might be left with nobody willing to put on Miku concerts in the future. 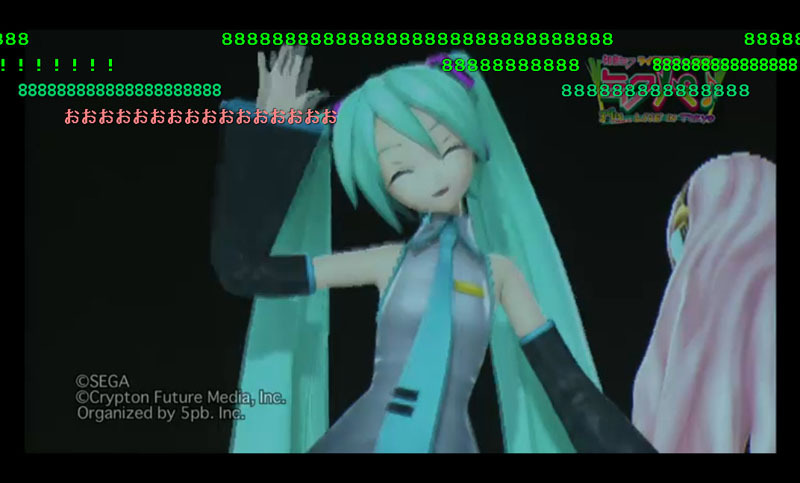 It wasn't perfect, but still, thank you Crypton, Sega, and even 5pb. Yup its such a conundrum. The concert was poor in many aspects but all of us fans want to see Miku and friends in concert so so so badly that it was still an AMAZING experience. We need to do our best to continue expressing our love of all things Vocaloid while offering constructive criticism for the future. I really hope concerts continue. I wish I could have seen the concert (even if I'm actually not a great fan of most of the songs in the list.). 🙁 Though I'm betting videos of the concert will probably be uploaded on Youtube soon haha. From what I read in another site (Korean), the 30 min intermission was due to technical problems. They were going to hold a Miku theme song contest with Miku's voice actor, but they couldn't since I think the transmission broke or something. Other complaints include the poor sound quality, the rather long live time-consuming performance before Miku actually showed up, and of course, the poor video quality that seemed like the viewers were watching out of the TV. Fans that watched the live video are apparently very angry and are demanding a refund. Because I haven't actually watched the concert myself, I won't say anything, but from the overall criticism and complaints, I think I can safely say that although the concert was still good, it was not as good as the previous one. To be honest, I'd rather the translucent screen and PDA graphics than the special effects. That transformation reminds me of P&SwG, niceeee. I probably would have enjoyed it more if I liked that song but I don't. But a very, very good point. One thing I have talked to my friends about all year is how they needed to add "effects" to the screen when Miku performs. That was my dream, and in someways it came true this concert. Sure it is not "realistic" but since Miku and Friends are real people this is not reason not to enhance the experience this way. 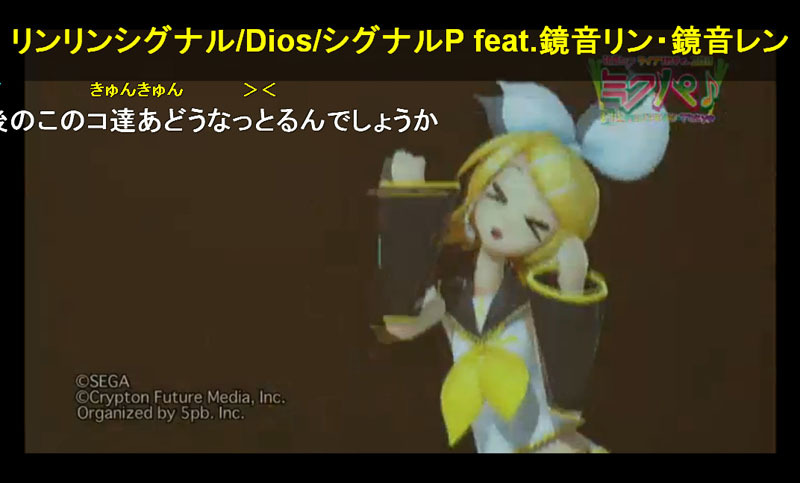 What I want to say is, I personally believe that the choreography for Rin and Len's songs "SUK'D ASSU!!1!!!1!" It's just so blocky and awkward. AND THAT THEY BUTCHERED MY FAVORITE SONG OF ALL TIME UNTIL IT MADE ABSOLUTELY NO SENSE AT ALL MAKES ME WANT TO PUNCH A WALL UNTIL MY HANDS FALL OFF. Ugh, I'm just so disappointed in this concert completely. Just over all. They should have just made 5pb step down and have SEGA make everything as godly was the last one. /sigh/ If they have a theater showing of this concert in San Fransisco, I'm going though. No way in hell would I miss seeing Len on the big screen again. 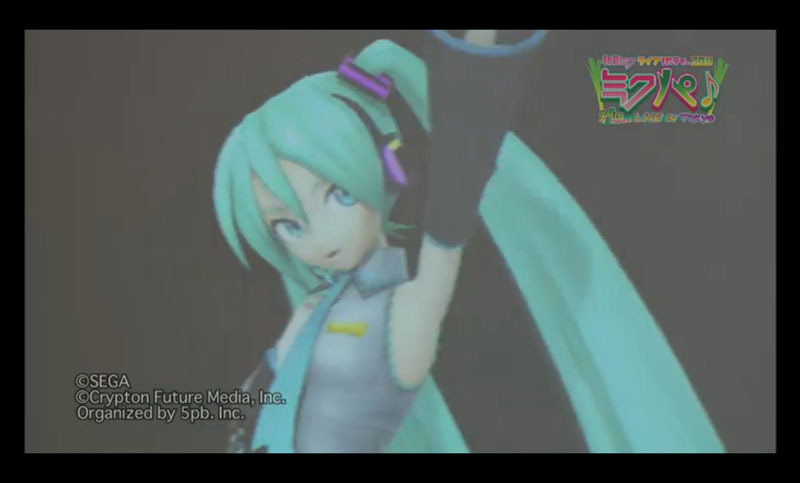 (I watched it there twice and met the CEO of Crypton. Not to mention they might sell some stuff they sold at the concert there). By the way, if you don't like my rant. Feel free to vote it down. I don't care. Just shows you guys don't like it when people have different opinions. Satoshi this is what comments are for, your opinions. Down votes should only be reserved for name-calling, trolling, and flaming (though all these should be deleted, thus there is never a good reason to down vote). I can't share your feelings specifically because I am not a big Len fan, but I know how you feel. I do think you should perhaps be a little less picky and hurt on this issue though. Mostly because this is where Vocaloid and commercialism clash. This is the commercial side of Vocaloid where what gets features and how is based specifically on popularity and sales versus a way to please everyone, this is something we have to accept. It doesn't mean you should like it, you just shouldn't take it so personally, IMO. Sorry, I often take things personally. It's kind of a bad habit of mine. But over the years of being ridiculed for liking Japanese culture and have virtually all the characters I've ever liked die, I can't help it. And sorry if I made myself all high-and-mighty, it's just that the Evil Series is one of the greatest things that ever happened to me. It completely changed my life from how it used to be. That they messed with it so much in this concert is what really made me upset, especially Servant of Evil. Maybe it would have been better if I hadn't watched the clips and waited until they had theater showings of it. Best of luck. The world will be watching on Youtube when you start making videos. Let people (including many Vocaloid fans) make fun of us but I don't doubt a song or series can be that meaningful to you. My commitment to loving Vocaloid and Miku is largely for the way Vocaloid rescued me from a very low and dark point in my college career last year. One down and depressing day like any other I opened a random facebook link to the World is Mine concert video, wtf'ed for a bit (didn't know Vocaloid), but after watching it over and over for about 30 minutes had found the rope to pull me out of my pit of despair for good. To this day Miku always keeps my spirit up. I consider Ai Kotoba and Yellow to be the songs that changed MY life, that showed me for once that somewhere there was at least a few other people who could put my views on what humble and dedicated love for all the wonderful people and things in your life should be, into beautiful and touching song. Thus both concerts were a dream come true when these songs played. After watching the whole concert, I have to say, besides some technical problems, it was AMAZING. Yes, the shoddy camera detracted a little from the experience when watching the broadcast, but not enough to truly enjoy it. Last year, it felt like Miku was actually on stage which was great. This year, it felt like Miku and gang were actually alive with all the extra facial expressions, audience interaction, and what looks like random moments of having fun. With those added in…it made really look like they were having lots of fun performing songs for the fans. The redone dance moves also made it more like a live show instead of watching something pre-recorded. The music was well done and the band did a great job. I swelled up a little when Miku shed that beautiful tear at the end. She was also super adorable when talking to the crowd. I had issues with the black screen used this year, but after watching the show…I had no problems with it. At least I could always see Miku up there, nothing washed-out and no glare. I've watched the concert (on youtube) a couple times now and all I can say is, its amazing. WAIT! DON'T SHOOT ME YET!! Please read what I have to say first, then you can brick me. First, I want to say that the songs they used this year were great. I was even surprised to the (sort of) recent song "cat food". And I freaked out when Len sang spice and fire flower (is a obsessed Len fangirl). Next, I want to comment on the models. Sure they lacked tremendously in detail, and I was very upset at how Luka's hair moved >:( and I missed how Len's tie swayed back and forth, but the dances were INCREDIBLE. The way Len knelt down to kiss rin's hand in the servant of evil was so touching, and the costumes, oh the costumes! They were beautiful! My favorites were Miku's shrine robe thingy and her fan, the trick and treat outfits, and Rin's kickass kimono in Iroha Uta. 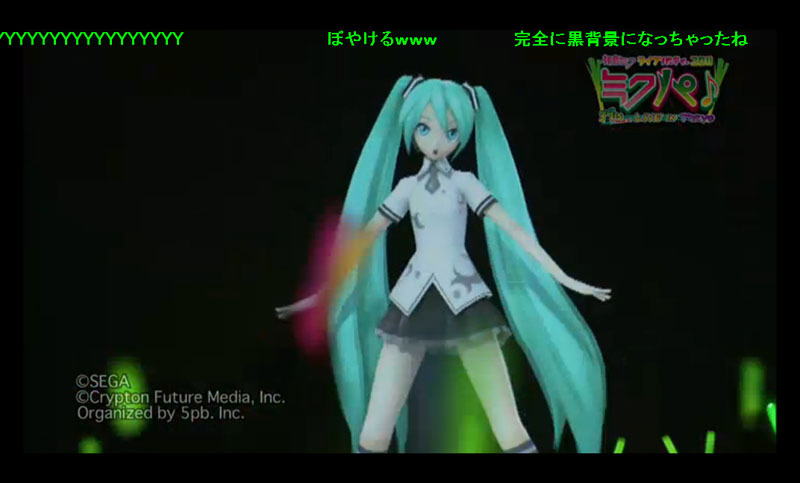 I also loooooved how Miku's skirt was "alive". It had stuff moving on it!! Their expressions were priceless. I cried when Miku cried and laughed at Len's face in Spice. Their dances were also really something. Their moves weren't just ripped from the project diva game. I was stunned by the care and thought put into each move. Lastly, I was to comment on the band. You can really tell they practiced a lot. During the several medleys, when ever there was a song transition, they pulled it off so smoothly, I couldn't help but squeal. But I am kind of disappointed in how the band was literary kept in the dark the whole time. My final comments are that I love how the glowsticks were able to change from green, to yellow, to pink, to show which vocaloid you were a fan of. I also loved how Len got the entire crowd to sing along to fire flower!! I totally didnt understand Rin's daughter of evil dress though… And I felt like Luka was totally rejected this time. She didnt get to sing that many songs, and her model sucked… Sega obviously put all their effort into the quality of the models last year, byt 5pb OBVIOUSLY put all their effort into the ACTUAL PERFORMANCE of songs and dances this year. which I think is waaaaaay more important. =D You make a valid point regarding the screen for the show. I'm currently on my 3rd viewing of the concert and during my 2nd viewing I noticed light shining through on Iroha Uta. When that happened, it really looked like Rin was on stage. The full covering of the screen still puzzles me on why it was there – what you mentioned makes sense. Not discounting your theory, as I didn't mind the screen, but the screen could have been a regular white projection screen with black as the background when the video of the vocaloids were playing that can still have a powerful enough stage light go through it. I guess we won't really know, unless there is a behind the scene video of the show. It was a black screen. The yellow light from behind Rin when she made her appearance for Iroha Uta was really cool. The yellow light from above was real, but it was just hitting the top of the enclosure. To make it seem as though the light was shining through, they just simply showed a yellow background with a black silhouette of Rin on the projector used to display her in the first place. How do I know this? Watch the video again. You'll see the yellow on the screen disappear faster than the light turns off because the projector can dim much faster than the light can. Still a really cool illusion though. Love Rin's & Lens costumesss! /infinitelove for Look At Me Baby!, Rolling Girl, Melt (always Melt), Daughter of Evil, anything featuring Luka (though the transfer from RIP=RELEASE to Japanese Ninja was really jarring – they should’ve stuck in a TakoLuka somewhere). Pissed about the lack of showing off the band and the commercial and basically about everything that 5pb mishandled. That smokescreen was p. cool up until the part where I couldn’t see the bandmembers (like I could seem them before, but still). /infinitesadness that they didn’t do “Last Night, Good Night”. It’s only my most favorite Vocaloid song ever. Not going to lie – crying Miku stopped my heart for a moment. Clarification: this year’s screen was LCD. Last year’s ‘screen’ was a large pane of glass with the Vocaloids PROJECTED ONTO THE GLASS. technically, it is NOT a ‘translucent/transparent screen’. Ysyd! Yus!!! 39th comment!! Woot woot! Let me show you the flaws in your theories which regard the properties of light. Ok. You said that the screen was glass being enclosed on all sides. If it were truly like you said, with no light reaching it, then no light would bounce off of it. Therefore we wouldn’t see anything. Again you said it was enclosed on all sides, YET you said that your proof is the spotlight SHINING THROUGH the glass. If it were fully enclosed, this wouldn’t be possible! This effect is very easy to accomplish since it is an LCD screen. 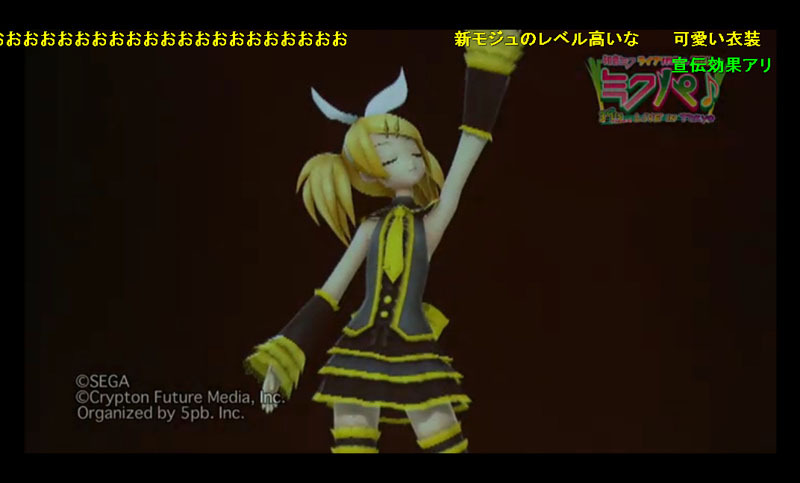 You can simply make a yellow gradient with the intensity in the center, then adjust the virtual computer programmed light behind Rin to make the 3d model black. Also, if the screen were glass, like last year’s, it would require a projector. If you understood the light properties if projectors, they CANNOT PROJECT THE COLOR BLACK. What looks like black is actually the contrast between the bright projector light and whatever you’re projecting on. So the white projection screen theory is also incorrect. So Rin would’ve looked washed out and see through. I also adored all of the costumes, song choices, choreography, as well as the creative exits and transitions after each song or medley. Moreover, I liked the black screen in the sense that you could see the models more clearly without blurring, fading, reflections, or translucently, though I agree the clear screen gave the appearance of a connection between the vocaloid and the band members. One of the last things I have to say about the concert pros was the models' eyes themselves. Unlike last years, this years models' eyes didn't seem dead and staring into space like I felt happened last year. I don't exactly know how they seem better or how they were changed but this is just my thoughts and opinions, and I'm somewhat easily impressed. Based on my feelings about this concert, the last thing I have to say is "not bad 5pb, not bad at all…"
Maybe I'm super late in putting this out, but in terms of effort, 5pb comes out on top, the concert animation was made from scratch, not a rip off of Diva 2nd using Dreamy Theatre models, so I actually liked the concert. Sure it is disappointing that they didn't use the transparent screen to make a more "real" like figure. My real complaint about this year's show is the band, why is the band different? Is it because 5pb don't have connections to the band, because the LA concert had the same band as 2010's concert. The drummer was frankly awesome last year and the guitarist (although not as nice to look at as the 2011 one) was beast. It is not possible to make a white projector screen look black. Why? Projectors rely on light, which shines through a small built-in LCD screen, through the lens for focus adjustment, and onto a surface as light. If you have a black image on the built-in screen, the light cannot shine through it. Also, black is the lack of light reflection, and that is not possible to accomplish unless the projection surface itself is black. Try it yourself. Also, it’s a large LCD, not a projection surface. Made from scratch is fine, but it doesn’t look as good… as someone who’s studied animation I can say at a technical level the animation at MikuPA was really pretty awful in several key areas – they really lack weight in their movement. 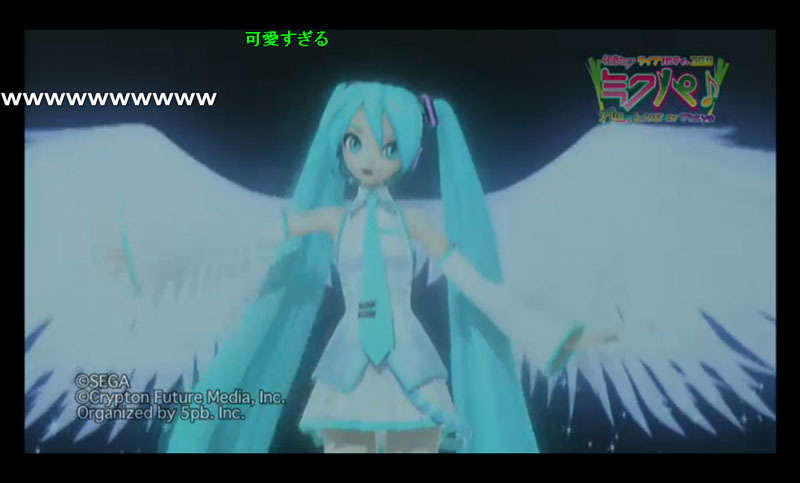 The edited project diva animations used by the internal SEGA team really have weight, you can FEEL that Miku is standing on the stage and moving around. Mazra Animation on the other hand use a very floaty animation mechanic. Luckily the internal team and Mazra worked together on the LA show! O.o? What do u mean..? and what exactly are u talking about? Maybe its because of the earthquake? Maybe that has something to do with their equipment and stuff? I’m a HUGE FAN of LEN KAGAMINE! and i think the way he sang Spice! was pretty awesome! Oh yeah, can someone give me a link to watch the live concert? Maybe a HD/HQ video link? Thanks! The abridged version of songs really bothers me. If they bothered to secure the rights for the songs, why not give us the full version? I rather have fewer songs but listen to my favorite songs in full.